A leaking pipe or protruding wires will send alarm bells ringing within any safety-conscious business, as well they should. When it comes to the exterior of a building, however, maintenance is often overlooked, with potentially catastrophic consequences. Businesses might think that ‘out of sight is out of mind’, but just because the problem is out of your eye-line doesn’t mean that those out-of-the-way, hard-to-reach parts of your premises should be overlooked. The physical risks to your business are obvious when you think about it, even if they’re difficult to see from ground level. They can include issues such as poor maintenance, the impact of a long winter and extreme weather creating leaks and other water ingress – all of which can build up over months or years before causing a sudden failure, for example, by unleashing a deluge that will flood your premises. These inaccessible areas are the source of several other problems, too. These range from the impact of birds damaging roofing materials, unremoved asbestos, to more banal (but just as important) issues such as standing water or damaged roof lights. It’s clear, then, that businesses need to pay particular attention to the parts of their premises that they can’t see. We all know that prevention is better than cure, and this is well-illustrated by the fact that many businesses do not approach these out-of-sight problems until they become a problem – and thus have to hire expensive equipment to put right any damages, or fix problems. When a floodlight fails or a roof starts leaking, businesses often find that the area is inaccessible without special equipment, which is why they have to hire a mobile elevating work platform, scaffolding tower, or a cherry picker to reach the right spot. These machines can cost hundreds of pounds a day to rent – and that’s not counting the cost of an operator, should your business (like most) lack someone with the skills and qualifications to operate them. There’s a simpler solution, of course, which is to invest in fixed ladders to reach these previously-inaccessible places. 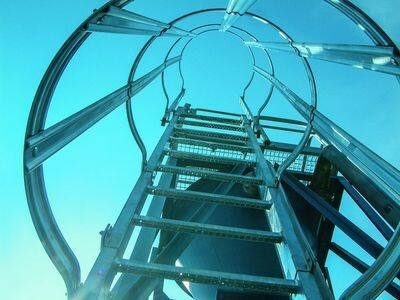 The cost of an eight-metre fixed ladder is in the region of £1,500, with an extra £800 for installation, meaning that the investment would quickly pay for itself when compared to hiring other access equipment over a long-term time period. Cost is an important advantage, but it’s not the only one. Investing in fixed ladders also brings important benefits in improved safety and convenience. 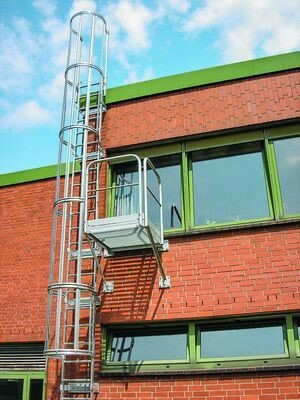 For example, with a ladder in place workers can access rooftops (or other hard-to-reach places) whenever they need to, rather than having to wait days or possibly weeks for the right equipment to turn up. There are also important – and, we hope, obvious – implications for safety. Using a fixed ladder can make it easier to reduce or wholly avoid the risk of accidents, since the business will always be using the same item of equipment, and thus doesn’t run the risk of workers ‘improvising’ and using inappropriate equipment in a dangerous way. This is a serious issue. Falls from height are still the number one cause of death and injury in the workplace. The most recent figures from the UK’s Health and Safety Executive report that such falls accounted for almost 6,000 non-fatal injuries in the 12-month period to the end of March 2016 – and 37 deaths. The risk of losing a valued member of staff to injury should make businesses sit up and take action over access – and that’s without worrying about the potential cost of lawsuits. We don’t want to talk about access in terms of fear and gloom. We’d much rather discuss how ladders can save businesses money, and enable them to effect repairs, maintenance or install equipment in hard-to-reach places in total safety, conveniently and at any time. Not every ladder is equal, though, which is why it’s important that businesses select a manufacturer that is CE-compliant, and provides equipment that is certified to the EN 1090 and EN 14122 standards. It’s also wise to choose a custom-made ladder that is perfectly suited to your business’ particular access requirements. This need not take long – ZARGES, for example, has an online configurator that enables you to input your specific needs and measurements, with a drawing and price available in minutes, and delivery in just three to four days. There a few other considerations to bear in mind. First, any fixed ladder must be inspected for operational safety by a technical expert at intervals appropriate for the operating conditions. This inspection must be carried out at least once a year by an appropriately-trained and qualified expert. We also recommend that every business keep an inspection log comprising fixed ladder check sheets which record all data concerning the ladder. All in all, it’s hardly a Sisyphean task, and a very small price to pay to ensure that you can access these important parts of your premises whenever you need. Choosing to install fixed ladders could well be one of the best investments your business makes – reducing costs, enhancing safety, and ensuring that no part of your building or machinery need ever be out of sight or out of mind.